This is show # 13 for April 1st, 2014… No Joke! This is the first “rebranded” show, now called Podcast Help Desk. Today I’m going to tell you how I rebranded this show including the website address, RSS feed, iTunes listing and everything. Step by step. First thing I did is get the new domain name. PodcastHelpDesk.com. I use Godaddy to get my domains and host my websites, but you can do this part using any registrar and host I’m sure. I had podcastingtechcoach.com going for a year or so and wordpress, powerpress and all my other plugins were installed and configured. Instead of starting from scratch, I decided I would just re-use the site I had and re-name it. Once I got the domain name, I went into the hosting part of godaddy and pointed the new domain name to the same directory as PodcastingTechCoach.com. At this point you could have typed “podcastingtechcoach.com’ or “podcasthelpdesk.com” and you would get to the same place. (once the change propagates) It’s called domain forwarding in most hosting control panels. The next step I did was to install a plugin called “Static Feed”. I configured it to take my powerpress feed (/feed/podcast/) and make it an xml file called Podcast.xml and put it in the root directory. What this does is make sure that if anyone hits the old feed which was podcastingtechcoach.com/feed/podcast/, it forwards it to the new feed at podcast help desk. It also tells iTunes and anyone subscribed in other programs, that the feed is changed permanently and to change where they look for new episodes. Stitcher is a bit different. If your show is listed on stitcher, you need to go in and manually tell it about the change. Just login to your partner account and edit your listing. It’s not too hard. 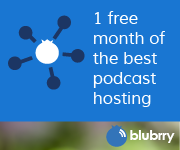 Blubrry and Tech Podcast Network. Both of these will pick up the change sooner or later, but I would (and did) go in and update it manually. In my case, it took iTunes just 1 day to pick up the change. Your mileage may vary with itunes. I’ve seen them take up to 3 weeks to pickup a 301 redirect. I suppose they are getting better. After all that I went in and did the rest of the rebranding on the website. Changed the title, tagline graphics and colors. This would also be a good time to change the theme in wordpress if you wanted. But be careful! Some themes do not play well with podcasting so be prepared to check things out before pressing on. Other things to think about is if your show has Twitter and facebook accounts. You will want to start new ones or rename the ones you have. Since this show isn’t really about social media, I will leave that one up to you. This show brought to you by Blubrry.com Media Hosting…. 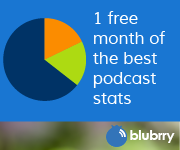 The promo code also works for blubrry premium statistics 1 month free by using the promo code nobs. This is more for listeners than for podcast producers. I’m sure most of you are listeners as well.